The International Association of Islamic Banks (IAIB), was established as a technical advisory institution for Islamic banks which began to grow up and spread all over the world as a reflection of the intent of the Muslims at community as well as national levels to introduce the economic tenets of Islamic particularly in the field of Islamic banking. It was founded on the 7th Ramadan, 1397(H) corresponding to 21 August, 1977. The text of documents was approved and deposited with the Islamic Development Bank, Jeddah. 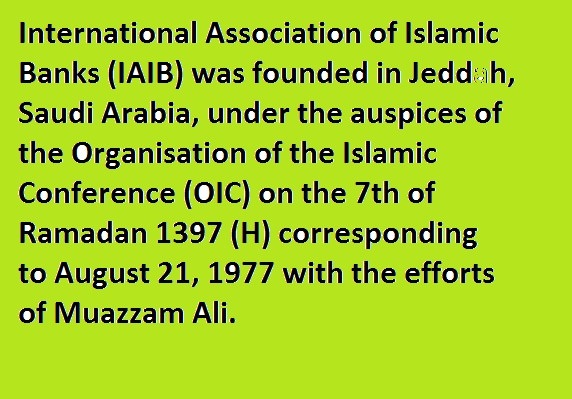 It received acceptance from the 9th Islamic Conference of Foreign Ministers held in Dakar, Senegal on 24-28 April, 1978. The Conference recommended that the member states of the Organization of Islamic Conference (OIC) fully support the Association. The text of the agreement to establish the Association was submitted to the OIC, which in turn distributed the text to all its member states in 1978. The Association was given an observer status by the OIC. Consequently, the Association has been represented at all the conferences of Islamic Foreign Ministers since the 9th conference and has also attended the Islamic Summits from the 3rd onwards as an observer. It has been playing an active role in the meetings of the central banks and monetary agencies of Islamic countries as well as in the meetings of specialized bodies of the OIC in the field of banking and insurance. Provisions of technical assistance and sharing of experience with those Islamic communities that wish to establish Islamic banks at request. Follow up on procedures for establishing Islamic banks at the local and international levels and support of their activities and assistance in their development. Laying down foundations for cooperation, coordination, and sharing of experience among Islamic banks as well as the exchange of information and data relating to positions and obligations of customers on a strictly confidential basis provided that such information shall be confined to member banks and not be circulated to non-members. The Association shall also assist member banks to overcome obstacles and sort out problems facing Islamic banks, without interfering in their executive affairs. Representing common interests of Islamic banks at all levels and defending interests of member banks. Endeavoring to facilitate the flow of funds among Islamic banks. Seeking to coordinate and standardize banking systems and procedures relating to Islamic banks’ activities. Enhancement and development of the performance of Islamic banks’ staff members. Provision of advice and undertaking studies of projects relating to Islamic banks together with offering proposals for attracting funds and identifying the role of Islamic banks in that respect. Undertaking researches on issuance in banking, money, and credit at the local and International levels proposing viable resolutions of the same, in order to enable Islamic banks to face those problems. Staging campaigns with the objective of enhancing awareness and propagating Islamic systems and transactions.